class="single single-post postid-393 single-format-standard wpb-js-composer js-comp-ver-3.6.12 vc_responsive"
There’s summer food and there’s winter food. In summer, I gravitate to food that’s like a summer dress: light, fresh and simple. In cooler weather, I’m into sweaters to warm me to my bones. Dinesty on Robson, which opened in February, is kind of like sweater food. The word ‘dumplings’ is writ large on the sign and that to me says warm, comfort food and on one cold, rainy day, I felt a tug o’ war between checking out Dinesty and going on a ramen hunt. Well, Dinesty was really busy, a pretty good sign. Busy doesn’t always mean great food — sometimes it means a lot of food, cheap. But in Chinese restaurants, if there are a lot of happy-looking Chinese diners, I’d count on a happy outcome. When we first sat down, two tables of tourists from Seattle near us had discovered each other; after they left, a Chinese family sat down. Mom and teenage daughter were intently texting and emailing and left it up to Dad to order, which he did and then immediately went on his iPhone. This is the second Dinesty. The first one, at 8111 Ackroyd Road in Richmond, is successful enough to have spawned the one in Vancouver and in November, there will be a third location in Aberdeen Centre in Richmond. Owner Johnny Huang (he once ran Vogue restaurant in Richmond) skewed this Dinesty to appeal to westerners. The dumplings are made on site (take a peek in the open kitchen). Several of them are cleverly filled with a soupy filling. They’re called xiao long bao, where the broth is gelled, cooled, diced, then mixed with other fillings and then folded in dough. Upon heating, voila! Soup inside! The menu is divided into Side Dishes, Snacks (dim sum), Noodles and Rice, Soups, and Entrees. Under the dim sum dumpling section, I liked the marinated beef wrapped in pancake and the green onion pancake but found flavours in the green melon and shrimp dumpling not well balanced. Under Noodles, stir-fried rice cakes with chicken was hearty and I liked the sticky texture. There are photos of many of the dishes — helpful when descriptions are minimal. I ordered the honey lotus root from the Side Dishes because it looked so yummy in the photo. Our server (who didn’t speak fluent English) confused us, telling us it would be served cold but we thought she said the kitchen had run out. We did manage to sort things out and ordered the dish, which turned out to be a little disappointing without the crunch I expected. Under Entrees, fried asparagus and scallops indicated the seafood is fresh. We ordered the camphor and tea-smoked duck because I like duck and not because of the association of camphor with moth repellent and embalming fluid. I was pretty sure I was safe because rosemary contains camphor and it’s used in Indian and Middle Eastern dishes. The platter of duck ($16.95) came with eight “shaped” steamed buns. The duck was gently smoked and really flavourful and I’m always impressed with a well-made, light, airy steam bun. Another interesting seafood dish is the Deep-fried Yellow Croaker. The photo shows it under bamboo basketry. It’s actually fried inside the basket which holds a deboned whole fish with ginger and green onions. Croaker, Huang says, tastes a little like tilapia. While dinner time is really busy at Dinesty, lunch has yet to get up to speed, so as of this month, there’s a three-dish, lunchtime special for $13.95. While dishes come promptly, I can’t say service stands out. It’s rushed and slapdash. While service isn’t notably friendly, the prices are. 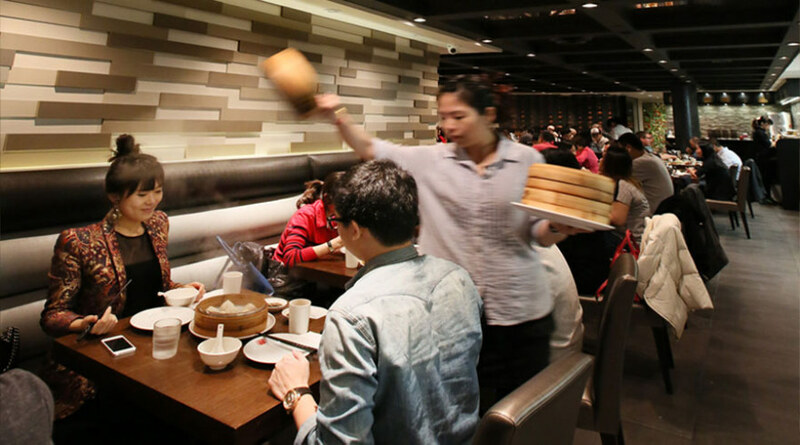 Noodles and rices are an average $8; dim sums snacks are about $4; entrée dishes are about $10. The menu is long but dishes are all uniquely different.